After Jacobs Field opened for business in 1994, baseball returned to Cleveland in a winning fashion. From 1995 to 1999, the Indians won five straight American League Central Division championships and two pennants. After the Chicago White Sox knocked them off their perch by winning the division in 2000, Cleveland rebounded in 2001 to again be top dog. But since then the Tribe was a nonfactor in the postseason. In 2005, the Indians entered the final week of the season ahead of the New York Yankees by 1½ games for the wild-card spot. But Cleveland lost six of its last seven games to end the season on the outside looking in. In 2007 Cleveland put together a 96-66 record and claimed its seventh division title. The Indians’ opponent in the ALDS was the Yankees, who finished two games behind Boston in the AL East Division with a 94-68 record and a wild-card bid. The Yankees held a 6-0 record against the Tribe in the regular season. While the Indians may have enjoyed some success in recent years, the Yankees were still the elite team in the majors. Since 1995, New York had been a postseason participant every season. The Yankees’ dominance included six pennants and four World Series triumphs, including three in a row (1998-2000). In Game One of the ALDS, Cleveland spanked the Yankees by a score of 12-3. Cleveland ace C.C. Sabathia was hardly spectacular (three earned runs in five innings, six walks, five strikeouts) but his Cleveland offense was a machine firing on all pistons. Ryan Garko, Asdrúbal Cabrera, Victor Martinez, and Travis Hafner all homered. Kenny Lofton, who was reacquired at the trade deadline from Texas, went 3-for-4 with four RBIs. Game Two started at 5:07 P.M. in the twilight of a sunny fall afternoon in Cleveland. Yankees skipper Joe Torre sent his star southpaw, Andy Pettitte (15-9, 4.05 ERA), to the hill. Pettitte shared the league lead in games started (34) with seven other pitchers, including Sabathia. Cleveland manager Eric Wedge countered with right-hander Fausto Carmona.2 The 27-year old pitcher from the Dominican Republic came out of nowhere to have a career year in 2007. After a rookie year in 2006 in which he posted a 1-10 record, Carmona pitched his way to a 19-8 record and a 3.06 ERA. Sabathia and Carmona tied for the team lead in wins, with Sabathia having only seven losses. If offense was the flavor of the day for game one, it was pitching for Game Two. New York scored first in the top of the third inning. With one out, Melky Cabrera lifted a home run over the fence to give the visitors a 1-0 lead. It looked as if the Indians might come right back when Jason Michaels led off the bottom of the third with a double to right field. But Pettitte was having none of it, as he retired the next three batters to keep the visitors’ 1-0 advantage. Similarly, the Yankees tried to extend their lead in the top half of the fourth when Derek Jeter led off with a single. But Carmona bore down and set down the next three Yankees hitters to keep the Tribe close. Grady Sizemore led off the bottom of the sixth frame with a triple to right, but Pettitte got Cabrera to ground out to the pitcher. Pettitte then struck out Hafner and Martinez to strand Sizemore. With one out in the seventh, Jhonny Peralta doubled and Lofton walked. 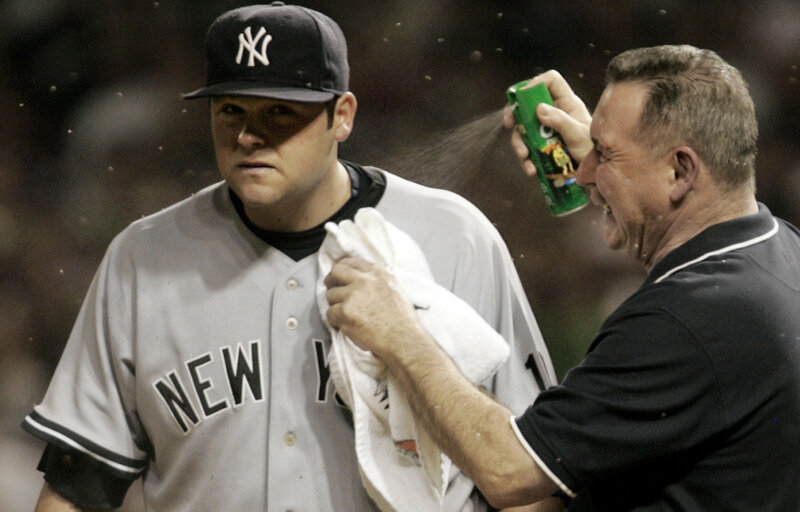 That was the end of the line for Pettitte as Torre brought in right-hander Joba Chamberlain. The rookie hurler struck out pinch-hitter Franklin Gutierrez, and Casey Blake flied out to end the threat. The score was knotted, 1-1. Mariano Rivera relieved Chamberlain in the bottom of the ninth. The Indians loaded the bases in the bottom of the 10th on a passed-ball third strike to Sizemore, an intentional walk to Martinez, and a Garko hit-by-pitch. But they couldn’t score a run. Reliever Rafael Pérez relieved Carmona after nine innings. He set the Yankees down in order in both the 10th and 11th innings. In the bottom of the 11th, Torre made another move to his pen, bringing in right-hander Luis Vizcaíno. Lofton led things off with a walk and went to second base on a single to left field by Gutierrez. Blake executed a sacrifice bunt, moving the runners up a base. Sizemore was given an intentional free pass. Cabrera popped out to first base for the second out. Cleveland eventually dispatched the Yankees in four games. The Indians took a commanding 3-1 lead in the ALCS against Boston, but they then lost three straight to end their season. The Yankees won another World Series two years later, toppling Philadelphia in six games. The author accessed Baseball-Reference.com for box scores/play-by-play information at https://baseball-reference.com/boxes/CLE/CLE200710050.shtml and other data, as well as https://retrosheet.org/boxesetc/2007/B10050CLE2007.htm. 1 Webster’s online dictionary, https://webster-dictionary.net/definition/Midge, Accessed October 13, 2018. 2 He was pitching under the name Fausto Carmona, but as it turned out later, his name was actually Roberto Heredia Hernández. Enrique Rojas, “Fausto Carmona Arrested in Dominican,” ESPN, January 20, 2012, espn.com/mlb/story/_/id/7480419/fausto-carmona-cleveland-indians-arrested-accused-using-false-identity. His baseball records are under Roberto Hernández. 3 Paul Hoynes, “Storm Troopers, Hafner RBI Top Yanks; Tribe Takes 2-0 Edge,” Cleveland Plain Dealer, October 6, 2007: D1.